Do You Suffer From Back Pain? Try Hydrotherapy! Back pain is a very common complaint. For some, back pain lasts only for a few days. For others, however, it becomes chronic. You can develop pain in your back due to direct trauma, spinal abnormalities, heavy lifting, obesity, bad posture or from health problems like arthritis. Hydrotherapy refers to using water for therapeutic purposes, whether it is in the form of steam, ice or liquid. Water jet massages and soaking in baths can help to relieve aching muscles. Hydrotherapy is one of the most effective methods of treating back pain. Benefits: Hydrotherapy exercise can benefit your back by helping to reduce pain, improve posture and increase flexibility. Exercising in warm water helps to soothe and relax tight, painful back muscles. It may also help reduce any swelling or inflammation around the bones and soft tissues in your back. Hydrotherapy helps boost your blood circulation, sending much needed oxygen to your back muscles. It is important to strengthen the muscles while managing back pain. Back Support: Although regular exercise can help reduce back pain, exercising on land may be difficult if your back pain is severe. Hydrotherapy exercise is an excellent way to get the therapeutic benefit of exercise without the strain and additional pain often associated with land exercise. 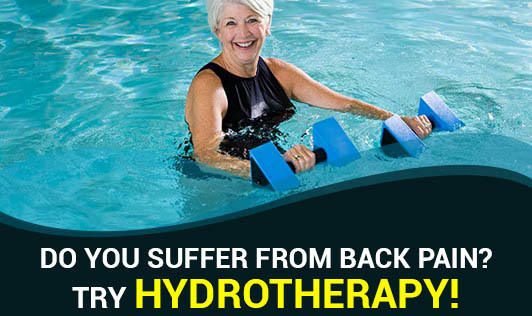 Types: There are many hydrotherapy exercises that can help ease your back pain. Gentle back stretching exercises or more vigorous activities like water aerobics or swimming is recommended. You may also want to incorporate the use of hydrotherapy equipment like flotation devices to help you maintain your balance. Engaging in hydrotherapy exercise to help relieve back pain is generally safe when practiced correctly. Please consult your doctor or a physiotherapist before you start.